packs available in multiple sizes, choose the size you want in the drop down menu box. 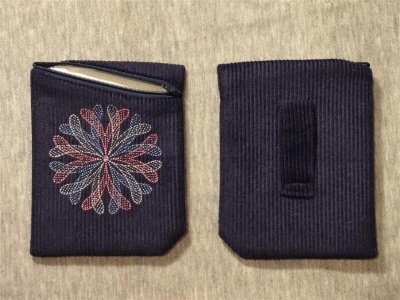 are constructed the same as my Zip-Around Eyeglass Cases, but have a wider area for embroidery. will be "just right" for your needs, as Goldilocks would say. dimension is 95 mm. 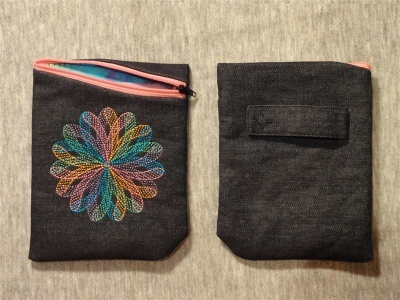 Since it fits in the 100 x 100 mm hoop, any embroidery machine can handle it. have a zipper in a color I wanted but did have lots of half zippers left from previous pouches. a stroller frame, or around the strap of a purse or bag. the same hoop as the previous design. include a pdf file with A Guide to Fancy Swirls. Thank you ccf201 and Pat. Have fun with the pouches. Thank you, these are so neat and different. You are welcome. Will you make a few for yourself and friends?